Less is more is a cliché that sums up the revised view at the Sky Suites in a post Harmon world. As Vegas properties have grown skyward, the primary downside is buildings obscuring the view of other buildings in the skyline. Mandarin Oriental & Cosmopolitan may be the current biggest offenders of this truth. I wouldn’t change it but with the constant evolution of the market comes new challenges. However having a building that did nothing but obscure the view seemed to be extra stingy lemon juice in the wound. @KyBen2000 shared this week how that wrong has been righted, at sunset, just before the magic happens. I love that time. It’s like that feeling you get when you’re getting fired up before taking the field to play a team sport. 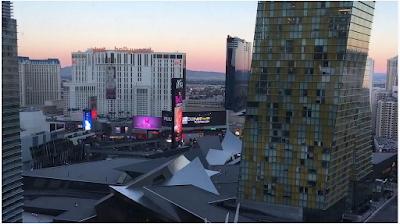 For me, in Vegas, when the sun is going down and the lights are starting to come on, it triggers that little, but steady, infusion of adrenaline into the bloodstream. Because I know the real adventure is about to begin and anything can happen. I’m about to live the Vegas story I get to tell all my friends about.